Presidential election results map. 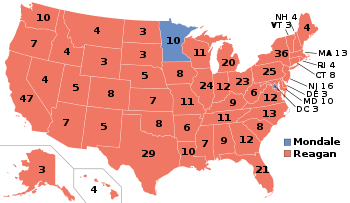 Red denotes states won by Reagan/Bush, Blue denotes the state won by Mondale/Ferraro. This election was a contest between Democrat Walter Mondale (the vice president of Jimmy Carter) and Republican Ronald Reagan (the president at the time). During the debates, Mondale criticized Ronald Reagan's idea (called Strategic Defense Initiative) to build a missile defense system and also criticized him for making the government borrow too much money. The bad economy of 1982 ended, and the economy recovered very quickly. During the election, the economy was the greatest has ever been in many years. Ronald Reagan called it "Morning In America". Ronald Reagan won the election by a huge landslide (winning 49 out of 50 states). This election received the highest electoral votes towards any presidential nominee in American history. It is the lowest electoral vote for a Democratic nominee and the highest for a Republican to date. ↑ 1.0 1.1 "The Election of 1984". Boundless.com. Retrieved January 5, 2016. ↑ 2.0 2.1 "1984 PRESIDENTIAL ANNOUNCEMENT SPEECH OF GEORGE McGOVERN". This page was last changed on 12 February 2019, at 18:22.